A fun but frustrating tour of spectacular Star Wars battles. A spectacular, occasionally very fun tour of Star Wars battles that disappoints with a boring story, crappy progression system, and endless grenade spam. What is it? A Star Wars shooter with big multiplayer modes, dogfighting, and a brief campaign. Multiplayer: Online competitive modes with up to 40 players. There is a right way to play Star Wars Battlefront 2's 40-player Galactic Assault mode. I haven't mastered it, but it's about maximizing the point value of each life and spending those points in the right way at the right time. It's made me a crappy sitcom's caricature of a gamer. "Man, I need more points to unlock Yoda" is definitely something someone would say on TV to indicate they're a gamer. I've said that multiple times. I'm a mockery, but I do enjoy it. I do want those points. If the campaign's story were better and the progression system not so irritating, I might have really liked Battlefront 2. I'm mostly talking about Battle Points, which are earned and spent mid-match to spawn as X-wings, AT-STs, jump troopers, wookiees, and all sorts of other Star Wars combatants, including heroes and villains like Yoda, Rey, and Kylo Ren. Your primary goal in any multiplayer mode is not your team's objective, whether that's blowing up a giant transport tank in Theed or stealing an AT-AT on Endor. It's earning those points so you can do some real damage. When I have too few points to spawn as anything cool, the race for more pushes me impatiently at objectives like the fodder I am. Playing as a regular trooper really feels like being an extra in the movies, as you're going to get smushed by walkers and have your guts cauterized by lightsabers near the end of a match. It's fun to be part of the spectacle, but the third time Darth Maul murders you the joy wears off. Conversely, once I've spent points to spawn as a special droid or a guy on a speeder bike or Rey herself, my life becomes precious and I become cautious—heroes are strong, but not unkillable. I feel like a god who just found out he's mortal and is extremely pissed about it. That push and pull rhythm is enthralling at times. Every little killstreak: more points! Every objective play: more points! I'm excited, sometimes frustrated, as I work to earn a powerful character, and then I get there and I feel like a god who just found out he's mortal and is extremely pissed about it—terrified to die, but eager to smash stuff. Most of my time is spent as a regular trooper, though, and the basic shooting is really more fun in the campaign, where the focus is all on spectacle (because it definitely wasn't on the story). There, most enemies are weak enough to kill in one headshot, while in multiplayer shields can take a beating, making most kills feel incidental: my shot happened to connect with someone whose shields were already at 20 percent. And the map design, though beautiful, can make for some dull battles. In the confined spaces most maps eventually push both teams into—a room to defend, such as the Mos Eisley Cantina—it's a lot of reckless charges and grenade spamming, or stacking up on walls and playing peek-a-boo. Each class has three special abilities, which vary in utility and fun. The Officer class can drop an auto-turret, but it's a puny little machine that makes very little difference—it really feels pointless. Most fun are the Assault and Heavy abilities, especially the Assault's shotgun, a secondary weapon that can be briefly equipped to one-shot droid heads at close range. The pulsing sound effect loop that plays while it's equipped is audio adrenaline, and its lethality makes it a lot more entertaining than the stock blasters. The worst thing about the Battle Points grind is its effect on teamwork. Making a careful approach as a squad is not a reasonable thing to do in Battlefront like it is in the Rising Storm and Battlefield series. It's a race for points, and in a race you run, usually directly at the objective (a jog that takes too long on most Galactic Assault maps) to lob a grenade and try to score some frantic kills before dying. In the Starfighter Assault space dogfighting mode, I find that players also tend to focus on player eliminations before objectives, which include fleets of AI controlled ships to attack and mines to destroy. Everyone wants to spawn in Poe Dameron's X-Wing or the Millennium Falcon, so everyone prioritizes earning points. DICE makes an effort to solve this: when you respawn, you're automatically placed into a squad, and playing near your squadmates earns you double Battle Points. But usually my squadmates break off and do their own things anyway, or die too quickly to help. They are hungry for those points, but it's a personal quest. I'm annoyed when someone grabs an Ion Cannon before I can to blast the MTT on Theed, because playing the objective earns points and those points should've been mine. It doesn't make for cohesive teams. I don't want to fight someone whose TIE-fighter is numerically stronger than my ship. There are even more points, called Credits, a non-cash currency you earn by playing matches and achieving milestones—the better you play, the more Credits you get. You can use Credits to unlock loot boxes which contain randomized awards, mainly Star Cards. Star Cards are a largely dull way to make your classes, ships, ground vehicles, and heroes stronger (I'll refer to all these things as 'classes' from here on to make it simpler). They're like Call of Duty's perks, except you can equip three at a time per class so long as you've sufficiently leveled up that class, and a lot of them are direct buffs. More health. Abilities recharge faster. Increased primary weapon damage. I don't like it, and I doubt I will no matter how much EA tweaks the rate I earn Credits, or the cost of unlocking heroes like Luke Skywalker. I don't want to quit matches to go to the 'career' page to slowly redeem Credits for every little milestone. I don't want to sit through the loot box animation to get a Star Card I don't care about. I don't want to fight someone whose TIE-fighter is numerically stronger than my ship. Some of the Star Cards are trade-offs—trade your grenade for a missle that locks on to vehicles, for instance—and I don't have an issue with those. I also don't mind that new guns and attachments require earning kills with a class, though it sure takes a long time. But I don't want to poke through a hundred menu screens (not an exaggeration) equipping little upgrades that make my weapons cooldown faster, and I don't want to fight a player who has. It's a system that instills doubt and resentment when an enemy kills you. Did they beat you with their skill? They probably did, but how can I know their upgraded Star Cards weren't the difference maker? Did I mention you can upgrade them? Sometimes you'll earn Crafting Parts in loot boxes which can be used to create specific Star Cards you want, and upgrade existing ones to make them more powerful. It's too much. When the premium currency was still available (microtransactions were temporarily removed on November 16), I didn't feel much pressure to buy anything, because I earned those Credits I don't want at a decent enough pace (I can unlock Luke if I want) and, truthfully, I probably wasn't really getting crushed because I had fewer Star Cards than more-skilled opponents. But my issue isn't just that players could buy power, though that is frustrating. It's that, to facilitate microtransactions, progression is slow, overcomplicated, and unfun. I'm skeptical that it will get more interesting and less burdensome before the premium currency comes back, unless it's overhauled and the returning microtransactions apply only to cosmetics. It feels like a comic book that was drawn before it was written. Outside of multiplayer and all that progression nonsense, the four-to-five hour campaign is a pretty good time. 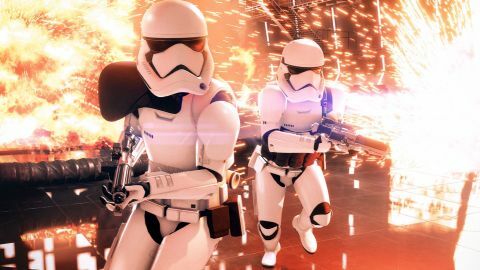 Its snappy levels run through all the best Star Wars moments: piloting TIE fighters, exchanging blaster fire down too-white corridors, force pushing Stormtroopers. The story is bland, but well-acted and there are some funny lines and entertaining cameos. You primarily play as Imperial hero Iden Versio, leader of special forces team Inferno Squad, a ruthless villain who has awfully malleable morals—so much that she's largely unbelievable. There's one particular smash cut meant to show that Versio made a moral choice that I thought was a bug at first, because of how little convincing she needed. It feels like a comic book that was drawn before it was written. Every other page features an exquisitely-inked battle we need to get to, so in between a few speech bubbles are filled in to explain why our characters are involved in it. After a few missions, the characters all do exactly what they say they're going to do, and all agree with each other all the time. Their big decisions are made whimsically and they largely grow off-screen as we leap between the galaxy's famous battles. The dialogue itself can be funny and clever, but the larger story is erratic, as if big chunks were cut—except in one particular mission that slows things down. In it, you play as a certain Force user and get to wipe out a squad of Stormtroopers with a lightsaber (fantastic), and it's a keen little look at how Empire lifers view the power of the Rebels, and vice versa. Using the Force with a lightsaber is appropriately easy, and I dug how it made me worry more about defeating an army with style than dying. As a hero of the galaxy, it wouldn't make sense for a Stormtrooper to even scratch me, and there's a fun game to trying to make my playthrough canon, mixing up cool abilities the way I think the character would. Holding down the right mouse button to auto-parry the same blaster fire I'd been hiding from in the previous mission feels badass. Even in missions without space magic, though, Battlefront 2 isn't too hard. In both singleplayer and multiplayer, the speedy fighter ships are hard to maneuver, but get close enough, and my main weapon will soft-lock on an enemy—so I feel skilled at dogfighting, but I'm not expected to do it without a targeting computer. It's a lot of fun to blow up an X-wing and careen through its debris. On the ground, I'm neither pinned to cover nor allowed to run around wherever I want. Only a few enemy types are spongy, and the rest often go flying through the air with a single grenade or headshot, which makes for proper-looking Star Wars battles. It strikes a fun balance between fragility and power, allowing me to play with enough bravado to experiment, but not so much that I don't have to eye my shield meter and retreat to cover when flanked. The main annoyance is the checkpointed saves, especially in space. Slightly too slow at destroying all the bombers because you went off to explore before the prompt showed up? Do the entire segment over. Did a great job with the bombers but accidentally clipped some debris? Start over. And because there's no ammo to find on the ground—guns generate heat which must be dissipated—there's disappointingly little to explore off the main path. In the first mission's light stealth segment, for instance, corridors I wasn't supposed to go down just led to closed doors. I have encountered a couple bugs, as well. The most egregious was when I defended my grounded ship from endless waves of enemies for several minutes—I wasn't counting—before realizing something must be wrong. I reloaded the checkpoint, and sure enough, a boarding ramp was supposed to drop a couple minutes in so I could escape. At least it happened on the second try. There's also a singleplayer Arcade mode, which basically is a series of bot matches. In some of the scenarios you can play as a hero or villain, for instance as Han Solo single-handedly defeating 40 troopers on a timer. The bots aren't very smart, and I spend a lot of time running around looking for them, but these are briefly entertaining ways to practice with heroes, and it's nice that you can set up custom challenges. Aside from the Galactic and Starfighter Assault multiplayer modes I've mentioned, there are three others—one in which everyone spawns as a hero or villain character, a smaller objective-based 'Strike' mode, and close-quarters team deathmatch. Strike, in which teams of six fight to steal or defend a package, is the most fun. The smaller teams and focus on one objective make teamwork incidental, as we're all getting into a fight around one object and eliminations, which everyone goes for in every mode anyway, are what helps. When my team has a breakdown, I love chasing down the package carrier alone to save the day. Look in the background, and there's always something happening: civilians running for their lives, ships fighting, ewoks scattering. That's the only non-Star Wars thing about Battlefront though. In multiplayer and the campaign, it's gorgeous and hilariously faithful—I especially love how anyone in the vicinity of an explosion goes flying, arms and legs flailing. The way my character's uniform flaps and folds, the foliage on Endor, even the lumpen cow creatures waddling around are delightful. Every map is supremely detailed. Look in the background, and there's always something happening: civilians running for their lives, ships fighting, ewoks scattering. DICE has outdone itself, and aside from the very long loading times, I've had no problem running Battlefront 2 at 2560x1080 with ultra settings on a GTX 980. It's not a lightweight game, but it's certainly easier to run than Assassin's Creed: Origins, and just as gorgeous. I also appreciate that it swaps between keyboard and controller prompts on the fly, since I switch whenever I hop into a fighter. The progression system is the biggest disappointment, but it hasn't ruined my enjoyment of the multiplayer. I get to fly the Millenium Falcon in the best-looking game where one can fly the Millenium Falcon. And flying through a bigger ship as a smaller ship is as thrilling as it always is in the movies. That's what I want, and other players having better Star Cards hasn't made me a punching bag—though I still hate being matched against more powerful players on principle. The Battle Points system has a greater effect on how Battlefront 2 plays than anything you'll find in a loot box. It's got me prioritizing assists, because they count as eliminations, and rushing around recklessly to play objectives—not to win, but to get my points. It can be fun, but it's always a little lonely. With everyone, even teammates, competing for personal glory the objectives and squads are secondary concerns. Everyone wants to be the hero.